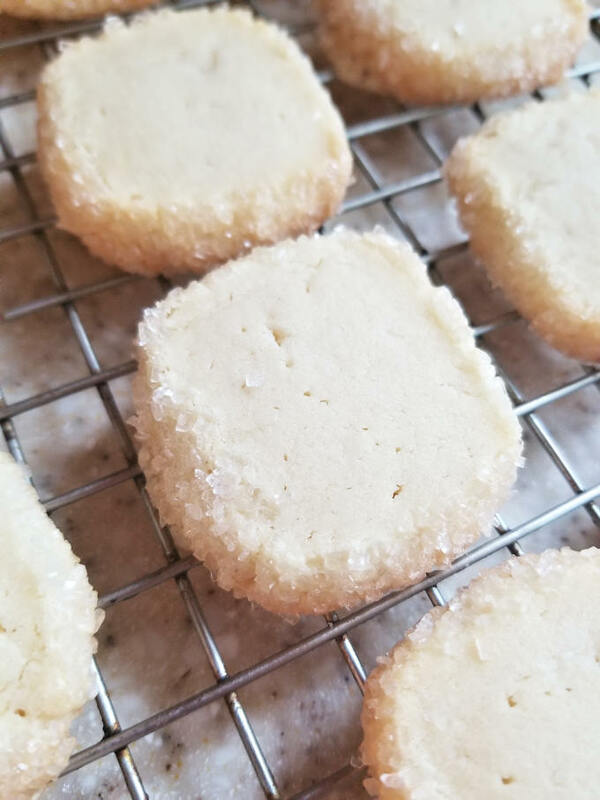 Sablé Cookies represent everything I love about french baking. 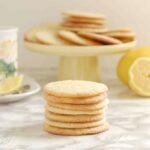 Sablés are buttery, tender and not too sweet. 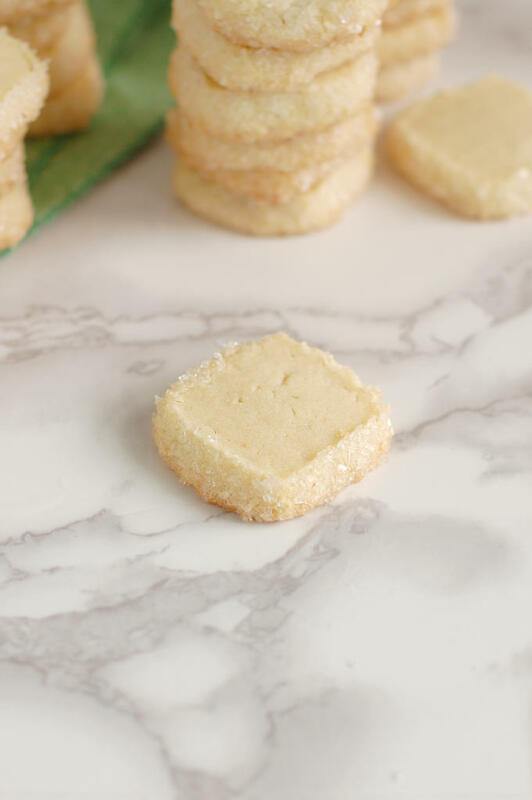 To make these “diamant” sablés, coat the cookies with crystal sugar for a crunchy, sweet bite. Shape them into cute little “diamond” shapes for a nice presentation. 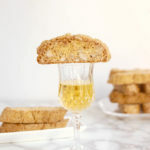 What I love about traditional French recipes is that they are all about good ingredients and technique. 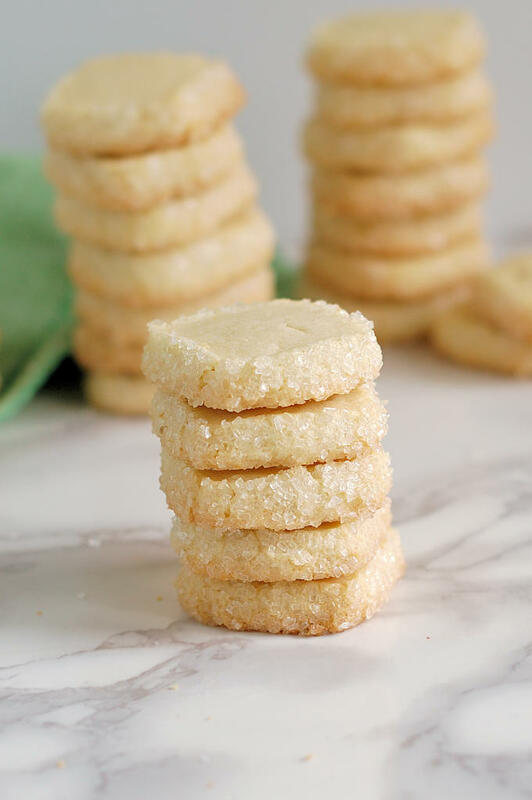 Rather than adding chips and nuts and marshmallows for a sensory overload, sablé cookies rely on good butter, sugar and a hint of vanilla for a perfectly elegant treat. 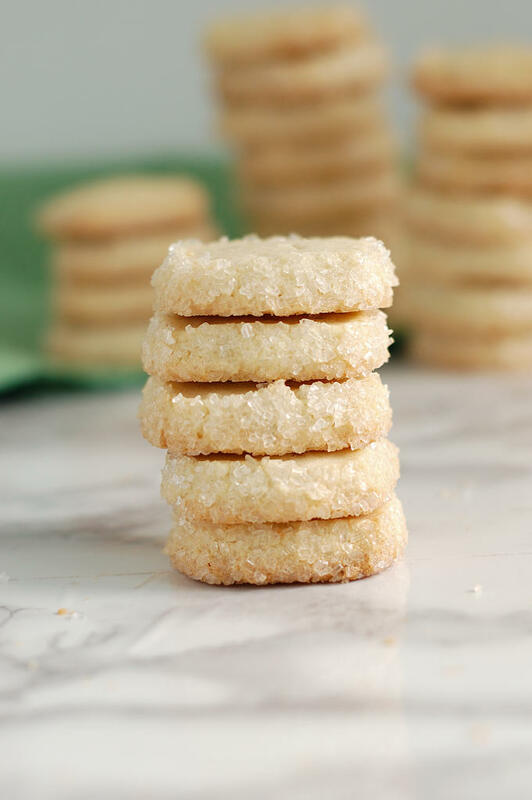 It may seem simple, but this is a grown-up and sophisticated cookie. 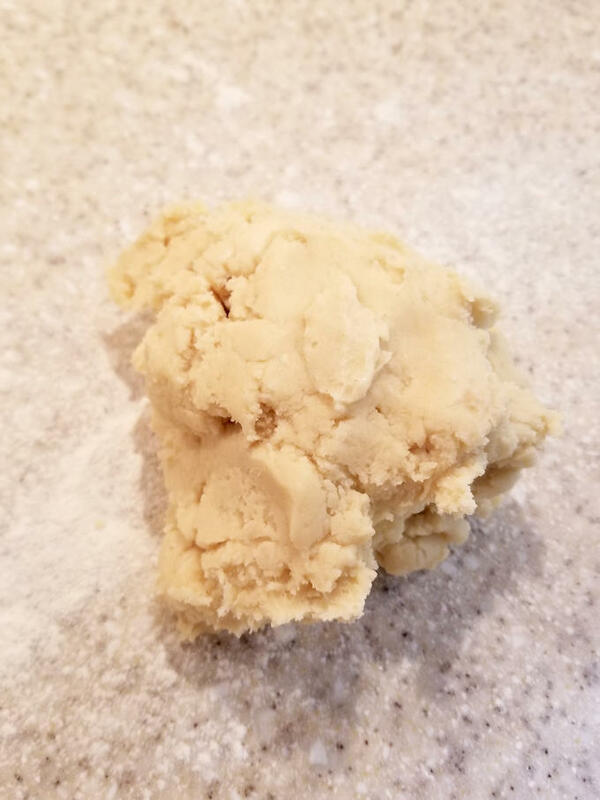 There are relatively few ingredients in this dough, so, my fellow baking geeks, lets dissect this recipe to see why these “simple” cookies are so special. Gather the “sandy” dough into a ball and knead briefly before forming into a log. 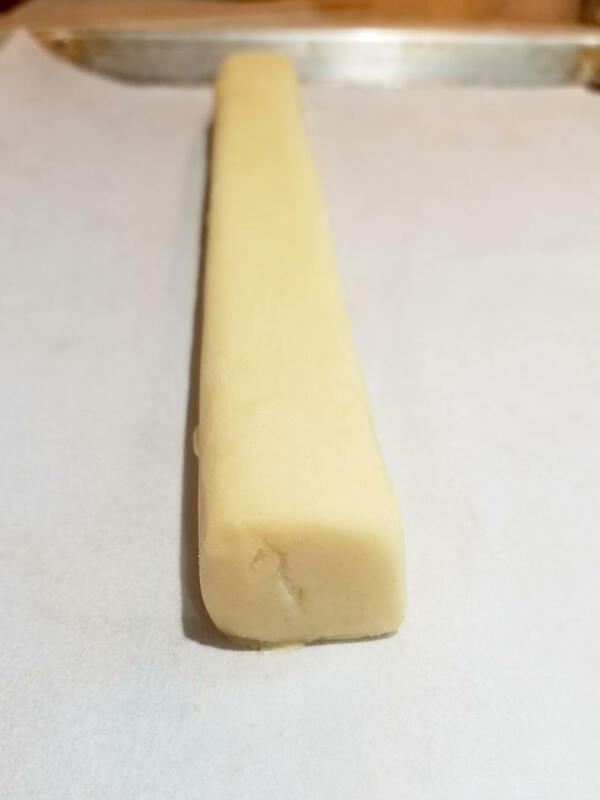 Use a ruler or other flat surface to square off the dough. 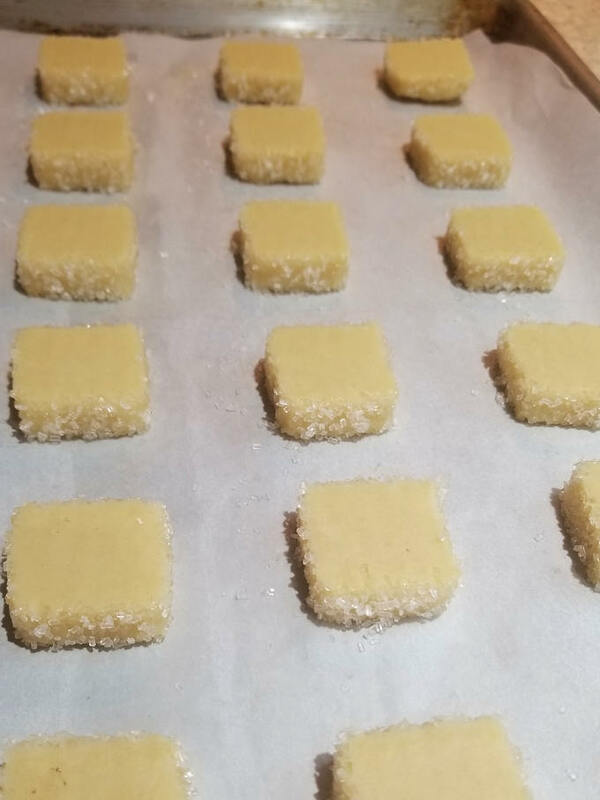 Square the dough to make diamond shaped cookies. Brush the dough with egg white to adhere the crystal sugar. 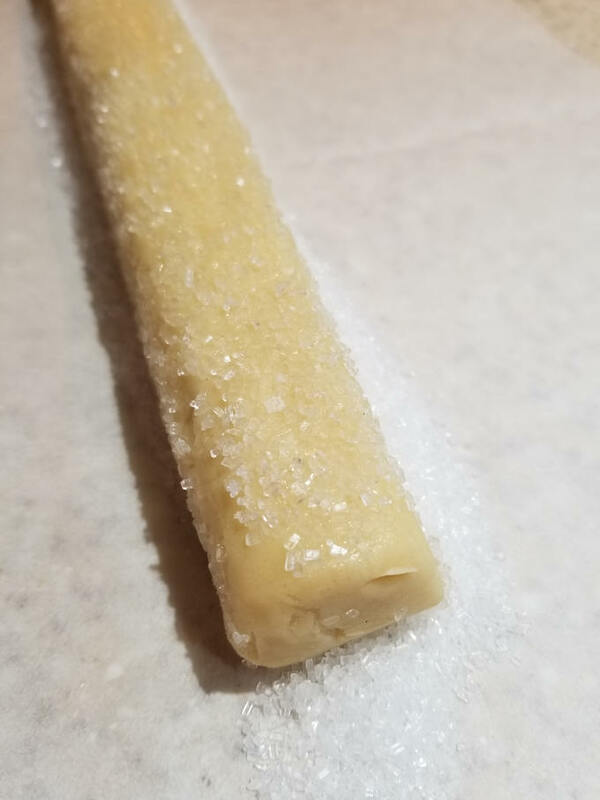 Roll the logs in crystal sugar before baking. Slice the chilled dough to 1/2″ thick for baking. 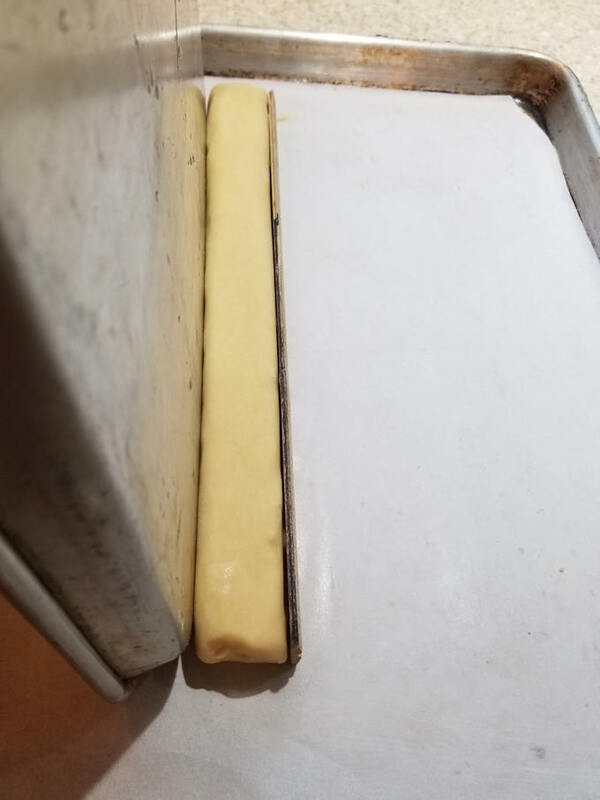 The dough doesn’t spread much in the oven. The cookies will still be pale when they are baked. First of all, you’ll see that there is a relatively high butter content in this dough, there’s almost as much butter as flour. Lots of butter not only means deliciousness, it also means the cookies will be very tender and crumbly. In fact, the word “sable” means “sandy”. 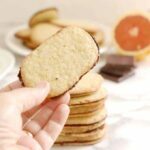 The baked cookies have a perfectly sandy, melt-in-your-mouth texture. Next on the ingredient list is the sugar. Key to this recipe is the fact that there is half as much sugar as butter. Off the bat, that means we’re making a less sweet cookie. 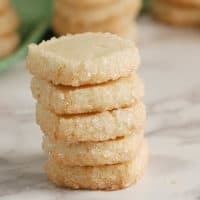 The flavor is balanced out by the crystal sugar coating, so we have a rich and buttery cookie that is not cloyingly sweet. 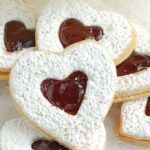 But please remember that sugar does much, much more than merely sweeten a recipe. Sugar tenderizes and it absorbs and retains moisture. We’re not done talking about the sugar yet, but lets take a quick detour and talk about the egg yolks. Most of the water in an egg comes from the whites. Because we only use the yolks in this recipe, it’s a fairly “dry” dough. As I mentioned, sugar absorbs moisture. A drier dough means we don’t need a lot of sugar to absorb excess moisture. I know, I know, “dry” is usually a terrible word to associate with baked goods, but it’s a good thing in this case. Because flour needs water to develop gluten, a low-moisture dough does not have a lot of gluten development. Less gluten means a more tender cookie. Of course, egg yolks add wonderful flavor, richness and color, but they are also great emulsifiers. When the egg yolks are added to the butter and sugar mix, the water in the butter is held in an emulsion with the fat. With the water trapped in the suspension, it’s not available to the flour for the formation of gluten. So using only yolks not only minimizes the amount of water in the dough, the yolks also make the water less available to the flour. 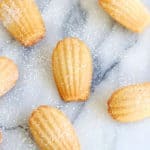 Last but not least, sablé cookies should hold their shape as they bake, not puff up and spread in the oven. 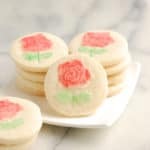 Cookies made from a very wet dough will spread in the oven, so that’s another advantage of a low-moisture dough. How do we prevent the cookies from puffing in the oven? Well, first of all we don’t use any chemical leaveners. 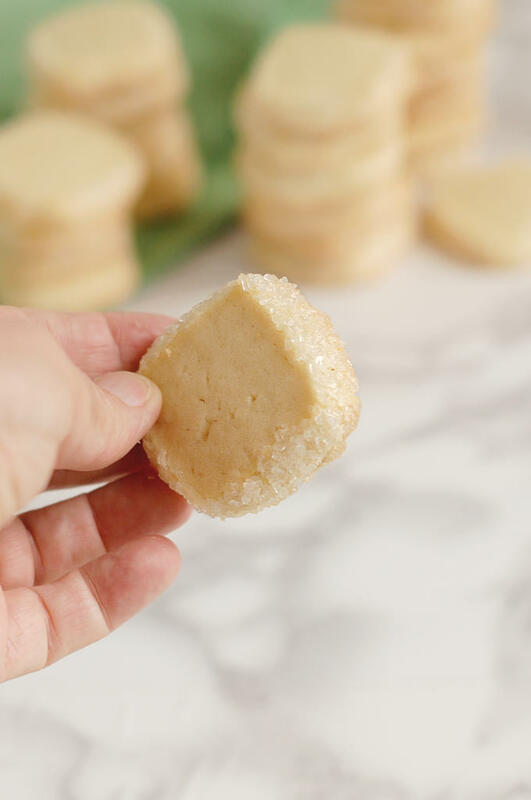 As you probably already know, when you cream butter with granulated sugar the crystals cut through the butter and form air pockets that help the dough rise in the heat of the oven. 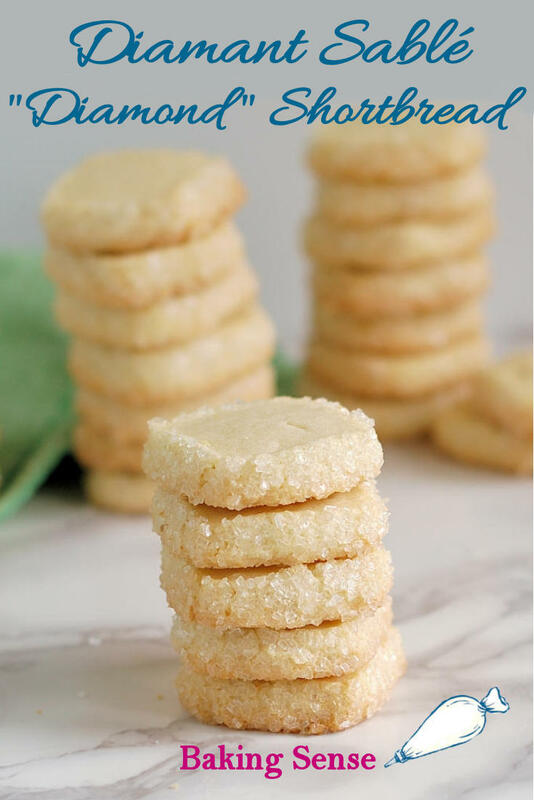 To minimize the amount of air whipped into the dough we use confectioner’s sugar for sablé cookies. Less air means less rise in the oven. Don’t over aerate the butter and sugar. You don’t want the cookies to rise too much when baking. 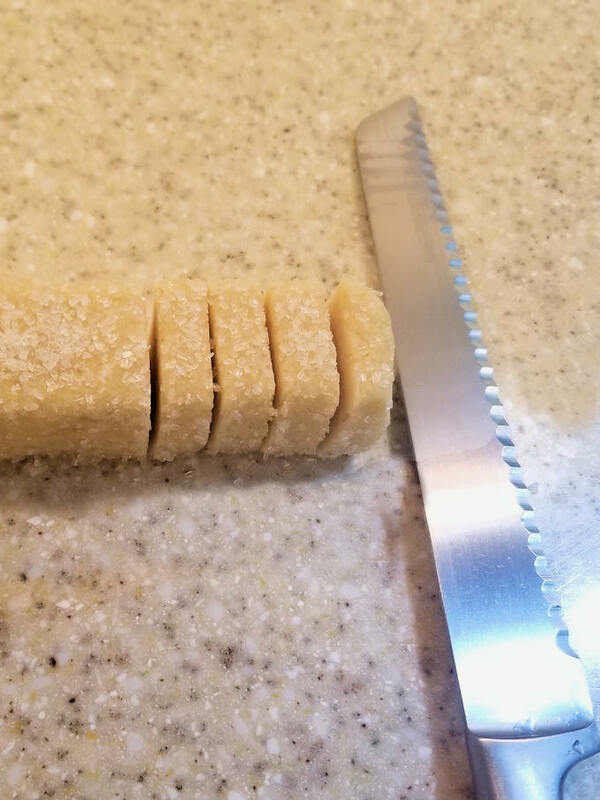 Chill the dough before slicing so the cookies hold their shape. To work ahead, the dough logs can be wrapped and frozen. The baked cookies will keep in a covered container for several days at room temperature. 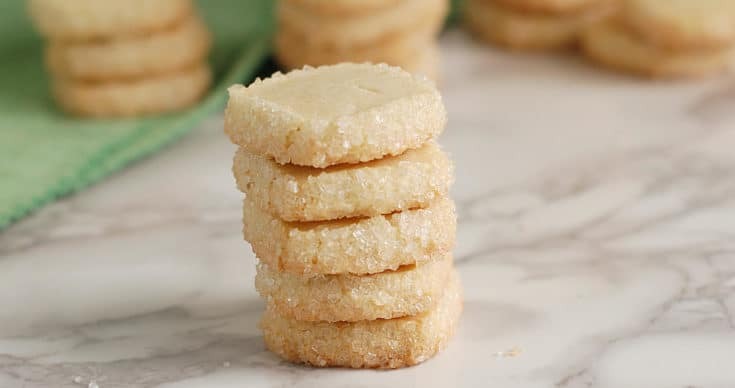 Buttery and light shortbread cookies coated with crystal sugar for a crunchy, sweet bite. I shape them into cute little "diamond" shapes for a nice presentation. 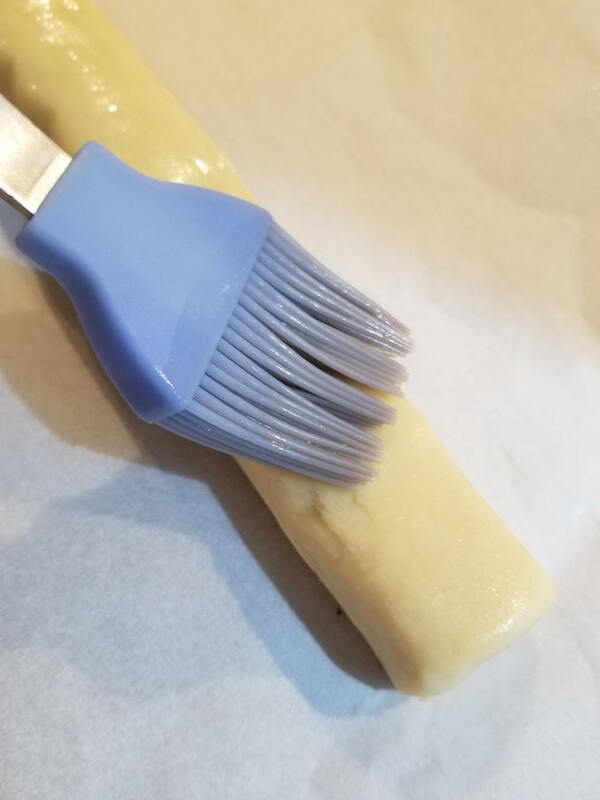 Cream the butter with the sugar until it becomes very smooth and lighter in color. Do not over aerate the butter. Add the egg yolks and vanilla and mix until combined. Turn off the mixer and add the flour. Mix on low speed until almost all the flour is incorporated. Pour the crystal sugar in a 12" long line in the middle of a piece of parchment paper or a silpat. Brush one of the dough logs lightly on the top and sides with egg white. Set the log, egg white side down, onto the crystal sugar. Brush the last side of the log with egg white. Roll the log in the sugar and press gently to adhere a coating of sugar on all 4 sides. Repeat with the other log. Return the sugar coated logs to the parchment lined pan. Chill another 20 minutes. Preheat the oven to 350F. If you have a second sheet pan line it with parchment paper or a silicone baking mat. Remove the logs from the refrigerator. Use a serrated knife to cut the logs into 1/2" slices. Place 24 slices onto each sheet pan. If you only have one sheet pan work with 1 log at a time. Bake until the bottoms of the cookies are golden brown and the dough is set in the middle, 10-13 minutes. The cookies should still be quite pale. Cool 10 minutes on the sheet pan then transfer the cookies to a cooling rack to cool completely. Store in a covered container at room temperature for several days. The logs can be wrapped and frozen for up to 3 months. Defrost the logs then proceed with the recipe to bake. So if I were to freeze the logs, would I do so before the egg white and sugar step? And brush and sugar the logs when they were defrosted? Or finish the process, freeze and then defrost and bake? Yes, I would freeze the logs without the egg white/sugar. Defrost then finish as the recipe describes. It might actually be ok to sugar them before freezing, but I think the defrosting process might get the sugar soggy.